In attendance were: Lachlan Crescent, Su Dolphin, Thomas Quatrefoil, Hrorek Chevron, Cormac Bellows, Bruce Oak Leaf, Santine Gold Forest, Catherine de Winter, Cassandre Nicole Loustaunau, Meala Caimbeul, Marion Fitzthomas (acting Lyondemere herald), John ap Griffon, Leonardo Geminiani, and Erik Loren. Upcoming meetings are: July 9 (this is a date change), August 20, September 24, October 22, November 19, and December 3, 2006. Laurel has accepted Caid's bid for Known World Heraldic and Scribal Symposium in 2007. This event will be hosted by the Caid College of Heralds in the Barony of Lyondemere, 19-22 14-17 June 2007. It will be held at the Crown Plaza Hotel at LAX, and hotel rooms will be around $94.00/night. If you wish to lend a hand in organizing the event, please contact the event steward, Baroness Éowyn Amberdrake. If you want to teach a class, contact Baroness Su, Dolphin at . If you have a contribution to the proceedings of the event, please contact Baron Bruce, Batonvert. The use of dolphins as crest or supporters on kingdom scrolls will no longer be restricted to Companions of the Order of the Dolphin. This does not change the general restrictions on use of helm, mantling, crest or supporters. 2. The armory displayed must be registered with the College of Arms and designated in the Armorial for use of the guild. Typically, this armory will be registered as a badge to the kingdom or to an individual or individuals. Crown Prints Prize Tournament is coming up next week. I'm certain Cormac, Bellows would appreciate help in conducting field heraldry on the day. We will also have a consult table set up. The Caid College of Heralds has been invited to participate in the Festival of the Rose, a celebration of Caid's guilds. Crescent thinks this is a fine idea, and is looking for help in devising fun and interesting ways to display the College's crafts. Please discuss with Crescent after the meeting. Unless otherwise noted, all submitters will accept the creation of a holding name, if appropriate. Approved submissions will be forwarded on the July 26, 2006 Letter of Intent. Amariah of Chufut-Kale. Kingdom resubmission device. Or, a bend sinister vert between a spider's web couped and a spider bendwise inverted sable. This is being returned for redraw. The color emblazon does not match the black and white copy. In this case, while the spider is almost clearly palewise on the black and white copy, the color copy further blurs the distinction between palewise and bendwise sinister. The spider should be drawn consistently between copies and clearly ether palewise or bendwise sinister. Since more than one year has elapsed since the most recent return, a payment is required. This emblazon fixes the problems with the previous return. Unfortunately, this conflicts with Or, a bend sinister vert between a sword palewise and a double-bitted axe palewise sable (Pedrwn Merchion, 02/90). There is a single CD via RfS X.4.e for change in type only of secondary charges. We note that the secondary charges should be drawn larger upon resubmission. Thea Gabrielle Northernridge. New Badge. (Fieldless) An escarbuncle of six drop spindles, bases conjoined at the center, argent. [Name] The submitter's name was registered 03/00. [Armory] A good deal of time was spent trying to decide whether the individual charges were recognizable and how to describe their arrangement. While we declined to rule on whether these problems are significant enough to require return, difficulty in blazon usually indicates a non-period emblazon. We believe this is a visual conflict (via RfS X.5) with Sable, a snowflake argent (Clovia Lumi, 01/73). While technically clear, the appearance is of only one CD for fieldlessness. Thea Gabrielle Northernridge. New Badge. (Fieldless) On a hand of Fatima Or, an eye azure. [Armory] The proposed blazon describes this charge as "a hamsa", the Hebrew word for this artistic motif. We have chosen to use the more standard SCA term, derived from Arabic, though certainly the submitter would prefer this registered as "a hamsa". Leonardo Geminiani. Kingdom resubmission device. Per pale azure and gules, in pale two lions and a bordure Or. [Name] Submitter's name was forwarded to Laurel on the 01/25/06 LoI. [Armory] In 03/06, Crescent returned the submitter's previous submission Azure, in pale two lions rampant argent for conflict with Azure, in pale two lions couchant argent, each maintaining a thistle Or. (Fearghus mac Ébhearáird, 02/98). This design is clear by change in field and addition of the bordure. This is nicely drawn armory. Alia la rousse. New name and device. Gules, in pale two tygers passant argent. [Name] The submitter did not mark any preferences. Alia is a feminine given name dated to 9th C. Reims, France (citation from Morlet's "Noms de Personne sur le Territoire de l'Ancienne Gaule", vol I, p.32). la rousse is a descriptive byname meaning "the red" and is found in the article, "an Index to the Given Names in the 1292 Census of Paris" by Colm Dubh, (www.sca.org/heraldry/laurel/names/paris.html). We note Alais la rousse and Alison la rousse. The examples show the byname uncapitalized, as in the submitted form. [Armory] Very nice, period-style design. [Name] The submitter desires a masculine name. He will allow all changes. Armin is a masculine given name, found in Withycombe (p.151 s.n. Herman). It is cited as a medieval English spelling of the French Armant, Armand. R&W (p.14, s.n. Armin) cite Ermyn Donetoun 1327, showing it to be a given name and Thomas Armyn 1481, showing the spelling variation from "E" to "A". Brokynheued is a descriptive byname meaning "broken head". It is found in Jonsjo's "Middle English Nicknames", p.65 with a citation of one Joh. Brokynheued 1332. Etain ban O Crowly. New device. Sable, an escutcheon vair within a bordure engrailed argent. [Name] The submitter's name appears on the Caid LoI of 04/19/06. Fleurette Kirkpatrick. Kingdom resubmission name and new device. Per pale vert and purpure, a frog between three mullets of six points argent. [Name] The submitter desires a feminine name, authentic for 11th Century. She permits all changes. The submitter's previous submission, Fleurette Christine Revielloue was returned by Crescent on 11/21/04 for lack of documentation. As more than one year has elapsed since the previous return, this submission requires an additional fee. Fleurette appears to be a diminutive of the period feminine given name Fleur. Douzat (p.258) cites Fleur as a feminine baptismal name used frequently in the Middle Ages. The use of -ette as a diminutive suffix is found at "An Index to the Given Names in the 1291 Census of Paris" by Colm Dubh (www.sca.org/heraldry/laurel/names/paris.html), which sites Jehannette (from the masculine name Jehanne). Then "Late Period Feminine Names from the South of France" by Talan Gwynek (http://www.sca.org/heraldry/laurel/names/latefrenchfem.html) sites Lisette, Margarette, Marette (Marie) and Mondette (Mona). Finally, "Given Names from Brittany, 1384-1600" by Tangwystyl verch Morgant Glasvryn (http://www.sca.org/heraldry/laurel/names/latebreton.html), lists multiple forms including Alanette (Alain), Aliette, Guillemette (Guillaume), Jacquette (Jacques), Jamette (Jamet). We note that there are many others in all three articles, which use the more common "-ete" ending. Kirkpatrick is a Scots byname registered to the submitter's husband Ian Kirkpatrick (04/05). Black (p.401) sites Roger de Kirkpatrick in 1194. The mixture of a French and a Scottish name is considered one step from period practice. Ian Kirkpatrick. New device. Purpure, a lamb rampant argent haloed Or within an orle argent. [Armory] The submitter wishes the main charge to be blazoned "a lamb" in keeping with the allusion to the Paschal Lamb. Unfortunately, this conflicts with Purpure, a goat salient and a bordure argent (Gillian Marie Hayden, 07/95). We grant no difference for goat vs. lamb, leaving us with a single CD via X.4.e for the change of bordure to orle. Ogan O Crowly. New device. Argent, five crows in saltire and a chief sable. [Name] Appears on the Caid LoI of 04/19/06. [Armory] Our compliments on the excellent cant. Caterucia Bice da Ghiacceto. New badge. Quarterly azure and sable, a fleur-de-lis argent. [Armory] This conflicts with [Fieldless] A fleur-de-lys argent (Catelin Parry the Patient, 09/97). There's a single CD via X.4.a for changes to the field. Grainne ingen Lasrach. New alternate name, Grace O Kenaith. * If Grace is only acceptable as an Anglicization, the Anglicization of Cionaoith (Kenny, or other variant) is also acceptable. Grace is found in Withycombe (pg. 138, header), dated in this spelling to 1562. O Kenaith is found in Woulfe (pg. 466, s.n. Ó Cionaodha), "common, in the 16th century". Gyldenholt, Barony of. New badge. (Fieldless) Three trees conjoined in fess Or surmounted by a fusa azure. [Name] The barony's name was registered 01/80. [Armory] This badge is to be associated with the baronial madrigal group. A "fusa" is a 1/8 musical note. Matheus Reyner. Laurel resubmission device. Quarterly argent and sable, two wings conjoined in lure counterchanged. [Name] Submitter's name was registered 01/06. [Armory] In 01/06, Laurel returned a previous submission, Quarterly sable and argent, a winged sword inverted wings elevated and inverted counterchanged for design problems; counterchanging a long, thin object along its long axis. The submitter's previous resubmission, Quarterly sable and argent, two wings conjoined in lure counterchanged, was returned by Crescent 05/06 for X.5 visual conflict with Quarterly sable and argent, a double-headed eagle counterchanged (Nikodemus Volk, 07/04). The reversal of the tinctures of field and charges removes the visual similarity. Santine Westmerland of Ravenstonedale. New name change from Santin Westmerland of Ravenstonedale. [Name] The submitter's current primary name was registered 04/02. The submitter wishes to release her name upon registration of the new one. The submitter desires a feminine name and will accept no changes. Submitted as Santine Westmerland of Ravenstonedale, no documentation was presented and none was found for Santine. As the submitter has indicated that she does not care about the gender of the name, we have changed the given name to the documented masculine form Santin in order to register the name. Westmerland of Ravenstonedale is grandfathered to the submitter. We believe that the submitter has provided enough additional research in support of the given name "Santine" for this to be forwarded and eventually registered. Nastasiia Viktorova zhena Volkova. New name and device. Or, a phoenix gules rising from flame proper within a bordure rayonny gules semy of onions Or. [Name] Submitted as Nastasiia Viktorova zhena Volk, the submitter is interested in a feminine name. She will allow minor but not major changes, and if changes must be made, she cares most about the language culture (unspecified, presumably Russian). All elements are documented from Paul Wickenden of Thanet's "A Dictionary of Period Russian Names (and some of their Slavic roots)" (http://www.sca.org/heraldry/paul). Nastasiia is a feminine diminutive of Anastasiia found in the 13th-14th centuries. Viktorova is intended as the genitive case of Victor, dated to 1356.
zhena is Russian for "wife (of)"
Volk is a masculine name dated to 1448-68. The examples in the submitter's source support putting the husband's surname in the genitive case. This should be Volkova, not simply Volk. We have amended the byname accordingly. The name means "Nastasiia, wife of Viktor Volkov." [Armory] This must be returned for lack of identifyability of some elements (see: RfS VIII. 3). The rayonny line of division is not identifiable: the "rayons" are too wide, giving the appearance of wavy crested, a non-period line of division. The onions are drawn so small as to be unrecognizable. Many in the room thought they were little flames. At the time of the meeting, we only received one $10 fee for both new name and new device submissions. Upon request, the submitter provided the necessary funds and therefore this is not an additional reason for return. Name approved as changed and forward to Laurel. Device returned for redraw. Theodosia of the Isles. New name and device. Argent, a bear sejant affronty vert between in saltire four letters "pi" purpure. [Name] The submitter checked no boxes. Theodosia is from the SCA website name article "Personal Names of the Aristocracy in the Roman Empire During the Later Byzantine Era" (http://sca.org/heraldry/laurel/names/byzantine/fem_given_names.html) where it is listed as a monastic name from the 14th Century. of the Isles is a locative based upon the Society branch name, "Isles, Shire of the" registered 10/82. [Armory] At the time of the meeting, we only received one $10 fee for both new name and new device submissions. Upon request, the submitter provided the necessary funds and therefore this is not a reason for return. Elisheva bat Yisrael. New name and device. Argent, the Hebrew letter "aleph" within a star of David within and conjoined to an annulet sable. [Name] The submitter is interested in a feminine name authentic for "Hebrew, Jewish" language/culture. She will accept all changes (form altered prior to submission), and if changes must be made she cares most about the language/culture. We note that Withycombe, p.99, cites Elishaba as the Hebrew form of Elizabeth. We note in the article "Jewish Names in an Arab Context" by Juliana de Luna (http://www.sca.org/heraldry/laurel/names/geniza.html) an example of Sara b. Israel b. Shal, showing Israel to be used as a given name in a woman's patronymic. [Armory] The use of alphanumeric characters is permitted, and the SCA has registered Hebrew letters in the past (v. Hannah Rosenberg, 05/02). De Bara's "Le Blason des Armoiries", p.152, shows examples of armories using Hebrew letters. Dalla Ormarsdóttir. Kingdom resubmission name and new device. Vert, a pair of angles palewise braced argent between three Lacy knots Or. [Name] Submitted as Dalla Ormarrsdottir. The submitter is interested in a feminine name. She will accept minor but not major changes and if changes must be made, she cares most about the language/culture (unspecified, presumably Old Norse). The submitter's previous name submission, Máire inghean Dhomhnaill, was returned by Crescent 03/04 for aural conflict. This is a completely new name. Dalla is found in Geirr Bassi (p. 9) as a feminine given name. Ormarsdóttir is a patronymic. Ormarr is found in Geirr Bassi (p. 13) as a masculine given name. According to the patronymic examples on p.17 of Geirr Bassi, the correct construction for "daughter of Ormarr" would have a single "r" and an accent on the "o". We've corrected the spelling. [Device] There was concern that the Lacy knots are too small to be identifiable. As is, they are borderline, at best. We think it is in the submitter's best interest to return this to the submitter with the advice to draw the knots about 50% or more larger. (See: RfS VIII.3). Herculle de Bourbon l'Archambault. Kingdom resubmission name and kingdom resubmission device. Or, a fleur-de-lys between two dogs combatant vert. [Name] The submitter is interested in a masculine name authentic for "16th C French". He will accept minor but not major changes. His previous submission, Ercule d'Archambeaux was returned by Crescent 10/05 for lack of documentation. Herculle is documented from "Names from Artois, 1601" by Aryanhwy merch Catmael (Sara L. Uckelman) (http://www.ellipsis.cx/~liana/names/french/french1601.html). There is one example of this spelling. de Bourbon l'Archambault is a locative. The submitter documents the community of Bourbon l'Archambault from "Monasticon" (http://monasticmatrix.usc.edu). This site indicates that the community was founded circa 1172. This city is also found in Columbia Lippincott (pg. 255, header), and is the site of the ruins of a 13th C castle built by the Bourbons. 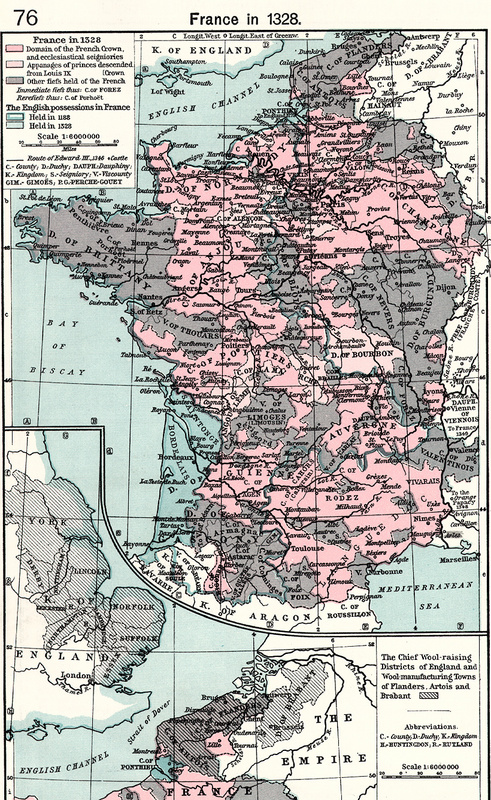 Please also see http://www.pitt.edu/~medart/image/france/france-l-to-z/mapsfrance/sf076fra.jpg (Map Title: "France in 1328", scanned from Historical Atlas by William R. Shepherd (New York: Barnes and Noble, 1929)). Within the Duchy of Bourbon is "Bourbon-?Archambault" (The question mark indicates where a portion of the name is obscured by the border of the territory). [Armory] The submitter's previous submission, with the same blazon, was returned by Crescent 10/05 for lack of a primary name. Kassia von Katzendorf. New name and device. Per fess wavy azure and Or, a bridge of three arches terminating in two towers triple-towered argent and two cats sejant respectant sable. [Name] The submitter will accept minor but not major changes. No other boxes are marked. Kassia is documented by the submitter from "Women Composers: Music Through the Ages Volume 1: Composers Born Before 1599", edited by Martha Furman Schleifer and Sylvia Glickman (http://tinyurl.com/em9ys). It mentions, "Kassia (born ca. 810) was a Byzantine nun from a wealthy Greek family." Also, a biography of Kassia "Kassia /Kassiane /-ni /Casia /Icasia (c.810-bef.867)" is found at http://home.infionline.net/~ddisse/kassia.html. Kassia (Kasia) is likewise listed in the "Christian Classics Ethereal Library at Calvin College" (http://www.ccel.org/s/schaff/encyc/encyc06/htm/iii.lxiii.xxvi.htm), which states, "She lived at Constantinople under the Emperors Theophilus (829-842) and Michael III. (842-867)." These appear to all refer to the same woman. von Katzendorf is a locative. Katzendorf is documented by the submitter from "International Civic Heraldry" (www.ngw.nl/indexgb.htm) [Webwright note: The URL given doesn't work, but the link goes to a page that apears to have the desifed information.] as a city in Bavaria: "Kasendorf received market and city rights in 1328... the older name of the town, Katzendorf (or cat-village)". Laurel has ruled: "This name combines Greek and German. No documentation was submitted and none supplied by the commenters to demonstrate significant contact between these two cultures. Barring such documentation names combining Greek and German are not registerable." (Andreas Sabas Doukas von Leiningen, 12/05) Without similar documentation, this submission must likewise be returned (see RfS III.1.a). [Armory] This must be returned for lack of identifyability of the wavy line of division (see RfS VIII.3). The "wavy" line, though admirably bold and deep, was so irregular as to be confused with engrailed. The submitter should be instructed to draw a more regular wavy line when she resubmits. Also the charge in chief was blazoned as a "castle", but not drawn as a period heraldic castle. This is not reason in itself for return. The multiple openings along the base of the wall make this appear to be a bridge, thus we have changed the blazon. If the submitter prefers a castle, as seems to be indicated by the proposed blazon, she should draw the end-towers closer together, and only a single portcullis in the wall between them. Name returned for non-period construction. Device returned for redraw. Dalla Ormarsdóttir has received awards under the names "Máire inghean Dhomhnaill" and "Dalla Ormarsdottir". Fleurette Kirkpatrick has awards under that name. Herculle de Bourbon l'Archambault has received awards under the name "Ercule d'Archambeaux"
Kassia von Katzendorf might be the same person who appears in the OP as "Kassia von der Katz"
Santine Westmerland of Ravenstonedale has awards under the name "Santin Westmerland of Ravenstonedale". De Bara, "Le Blason des Armoiries"
Jönsjö, Jan. Studies on Middle English Nicknames. vol. I. Compounds. Schaar, C. and Svartvik, J. eds., Lund Studies in English 55, 1979. Morlet, Marie-Therese. Les Noms de Personne sur le Territoire de l'Ancienne Gaule du VIe au XIIe Siècle. 2 vols. Paris: Centre National de la Recherche Scientifique, 1968.